I would like to grow strawberries in my SFG this year, I have many many plants from last year. I see that you can grow 4 per square foot. Any tips of growing them? Would you suggest straw between plants. I have just never done them very well. Have you seen the strawberry pyramids that some of the people on here have built. You can get a lot more in there than just a flat bed. I really want to build one. I've never tried the pyramid because strawberries don't produce many fruits until their second year and those small holes don't look big enough to hold a full-grown strawberry plant (2nd year). In fact, the 1st year you should pull off any new blossoms so the energy can go into building its root system. 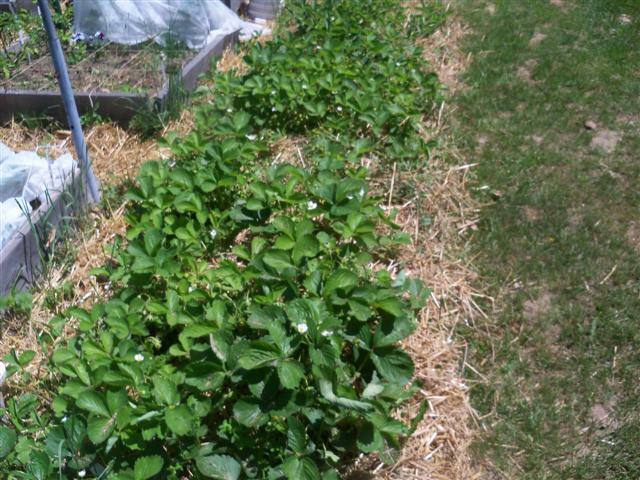 I do mine in a berm (long raised bed without lumber) but a few tips would be, tuck straw around them for a mulch which keeps the berries off the soil which can cause them to rot. Also, in the winter, you want to cover the bed with straw about 6" deep. They'll sleep under that straw and any snow covering and do just fine by spring. Every 3rd year you need to dig out the old 'mother' plant and allow her 'daughters' to take over production in her place. The 'daughters' are runners that have grown out from their 'mother' plant. You never have to buy new plants again. That bed will give you plenty of 'daughters'. In fact, this year when I thin out my bed, my extra runners are going around the dwarf fruit trees. Above: On 6/7/11 when blossoms were just starting. When the little fruits begin growing, you need to cover them with netting or light row cover against the grasshoppers and the birds. In one morning the birds practically cleaned out my whole 16' long bed in 2010, the same day I bought the row cover, but too late. I know its been done successfully in a SFG but I want lots more than a 4 x 4 will provide, hence my berm. I'm sure fellow growers will chime in with more info for you. It seems as though I might have done the best thing last year. I had an 11x3 foot raised bed that I filled with strawberries and I got SOOOO many runners, PLUS I did not keep up on the weeding. I am trying to remember whether I actually dug up the mother plants and replanted them, OR whether I left the mother plants. I can see that leaving the main plants to establish roots is what it takes to really get them producing. I did cover them all up with straw in the fall though. I am just hoping for tons of strawberries this year. My strawberries are four to a square - in theory at least. I have about 12 sq feet of them, some are established and some are plants from last year's runners. We have had about 200g/day for the last month. I don't bother with straw as the plants are so close together. Any berries which are hitting the ground I just try and hook the branch over a leaf to give it some support. We have cold winters here and I think it works best to leave the plants uncovered until the new year (kills off the bugs I think) then cover them with a sort of coldframe top with wooden sides and plastic top. That seems to bring the crop forward about two weeks. Though the plants will survive without it they don't crop so well. It means watering a few times in very early summer, then when there is no risk of frost you can take it away. I like that pyramid. You could build that to fit right over the top of an existing SFG box. When we built our pyramid we devoted 6 square feet to it. We built the 6 foot base, set a four foot tier inside it, and a 2 foot tier inside that. We didn't do anything fancy with it, just built a ziggurat framed in wood and built up the center with sand and dirt as we placed the tiers, and filled the growing areas with compost. I based the thing on those ones you see in the nursery catalogs. Then we threw 50 Ozark Beauties into it and we have had strawberries ever since. The only problems I have ever had with it are theft, and an errant grapevine that keeps trying to grow in there. Last spring somebody came into my yard and stole about two feet of plants, dirt and all. I am to the point with the grape where I am tempted to guy a line from the pyramid to the house and train the stupid thing since it just keeps coming back! I love that idea. Even if it is a wild grape and a bit tart for just eating, you can have some awesome jam/jelly. Point of interest: Its the 3rd year when the Mother gives her best and most berries. Its downhill after that so its best to remove the Mother after that harvest and allow a 2-yr old runner to be Mother next year. Its a matter of cutting out the old plants and letting the new ones take their place for continuous year after year berries. I am getting ready to build my 3x7 SFG for strawberries: Here is a State specific guide for folks if you are thinking about putting in some berries! Also check your local extension agency, they have tons of info. I want a variety, day neutral, June bearing and early! Hello all. It's been a while since I posted. I did not do much with my SFG last year and probably won't do much this year either. With that said, I have a 4x4 full of strawberry plants. They started out as 1 half-dead plant and ended up taking over the bed. I have thinned them out slightly, but not much. So, what IS the proper spacing. I keep reading 1 or 4 per sq ft.
Also, I am considering making a berm so I'd appreciate any insight on that as well. Hi, Jim! 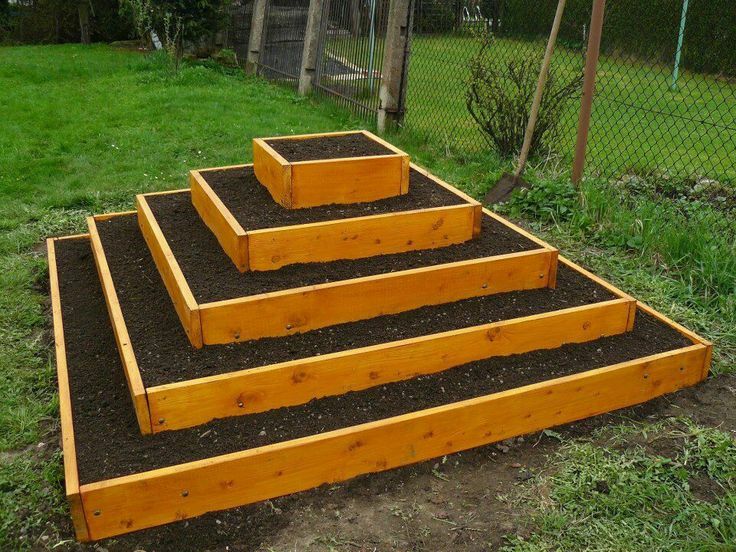 I don't grow Strawberries any more - got tired of fighting the deer for them, and just gave up - but, when I was growing them I grew them in a pyramid-type raised bed similar to this picture. They did great in there, and the runners from the plants went over the edge into the soil below. I had the raised be sitting on a heavy base of wood chips, and the strawberries even grew in the chips after they went over the edge of the bed. I originally spaced the plants 12" apart, and each year I removed the old plants and kept the new ones that started from the runners. Every year the berries were better than the year before. OhioGardener - Do you remember the size of the boards that you used to build this pyramid? I have a bunch of 4"x 48" cedar boards that I could use but am wondering if they are too small to be effective. I have a 3x7 devoted to strawberries, and I use 1/SF as a rule. @Judy McConnell wrote: OhioGardener - Do you remember the size of the boards that you used to build this pyramid? I used 2"x6" boards, which worked well because the strawberry plants are fairly shallow-rooted and don't need much more than that. 4" would probably be too shallow, though, unless two ware stacked to provide an 8" height on each level. OhioGardener - Thanks for the info! The 3x7 is 6” deep...plenty deep for the berries. Just my 2 cents: If you build that pyramid, wouldn't you only have to make the bottom level 6" or deeper. The upper levels could use one 2x4 since they will have the MM in the levels below for their roots. FWIW, the first pyramid I built I used 6" high rolled aluminum that was designed for kids pools, and I made the bottom 6' diameter and each tier up about a foot smaller until the top one was down to 2' diameter. That was when we lived in town with a small lot, and I built the pyramid as a "flower bed" on the front lawn. When we sold the house a couple years later, the new buyer loved that "feature" of the property. I have 2 -4'x 8' beds, currently in strawberries along with 4- tts with young runners. The 4'x8' need renovating and I want to get the table tops free of strawberries, in order to use them for other plants. So, what I am going to do is remove all the berry plants from one of the 4'x8' and build a pyramid in each half of the bed. This will allow younger plants to grow there, each with enough root space.